[01:18] Is there a benefit to speaking more than 1 language? 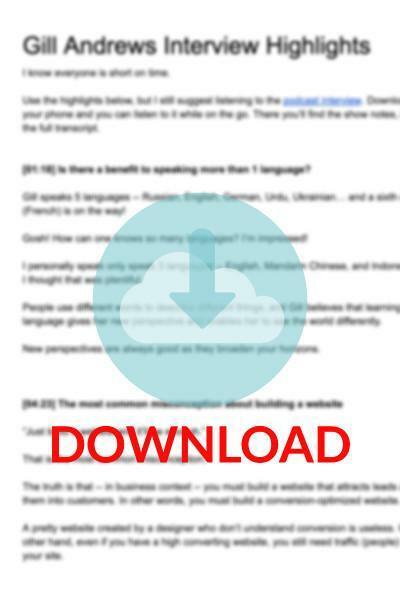 “Making your website convert is a lot like translating your message into another language”. Welly Mulia (Interviewer): Welcome to another episode of the BirdSend Academy podcast, this is the show for online course creators who want to build a profitable business by sharing your skills and knowledge, this is your host Welly Mulia, if you are not listening to this on our website, go to academy.birdsend.co/5 to get your show notes. This show is brought to you by BirdSend Email and Marketing Tool; the only email and marketing tool specifically created for online course creators. Get your free forever account at birdsend.co. Today’s special guest is Gill Andrews, Gill helps small business owners make sure that their website reflects the true value of their products and services and knock the socks off their prospects. She turns underperforming websites into sleek, lead generating machines and she is direct about that, she wants to work with it, but she will tell you how to fix it, when not reviewing websites, writing a copy or blogging, you will find her running after her son or eating chocolate. Gill, thank you for coming to the show, it is great to have you. Gill Andrews (Interviewee): My pleasure, thank you for having me. Welly Mulia: So, 5 languages… I read on your site that you speak 5 languages? Talk to us about that. Gill Andrews: Just one word; life, I never aimed to learn it, it just happened, I was born in a Russian-speaking family, then we moved to another country and we moved to Germany, actually there is one language I forgot, I used to speak Finnish as well, I used to work as a translator, but I haven’t used the language in 16 years, so I forgot about it and I learned it at the university. So I learned English, I learned Germany, and then because my husband is from Pakistan, I learned it as well, whatever they speak in Pakistan. So, it’s like it just happened, I like languages, it gives me a new perspective every time, once you learn a new language, you start seeing the world a bit different, because people use different words to describe different things, and some things you describe in one language don’t exist in another language, it changes you, it changes your perspective, so that’s fine. And my dream is also to finally get my French up to speed, because I understand a bit of French, I can speak a bit of French, but I never got a chance to really apply it, maybe that’s why it’s rusty and I never got to learn it. But the short answer to your question would be, life happened. Welly Mulia: So, with the addition of French, would it make it 6? Welly Mulia: Cool. So, what is the language that you are most proficient with, is it English? Gill Andrews: Actually my mother tongue is Russia. English and German, they are equal, I speak equal English and German, Ukrainian as well, because I used to live in Ukraine, but I keep forgetting it, I am already on the way to forgetting it, I don’t speak it to my son, I speak Russian to him. And although I speak it all of the time, but not that much. So, the most proficient would be Russian, followed by English and German. Welly Mulia: So, you are a website specialist, you are a conversion specialist, you take ordinary websites and turn them into lead generating websites that get clients leads. Welly Mulia: So, what do you think is the one misconception about people having a website? Because nowadays everyone wants to have a website. Gill Andrews: I think the biggest misconception is that they think, okay, I’ve built a website and that’s enough, they over-estimate what a website can do for them, or that you need just a website, then it happens. So, first of all, you don’t need just a website, you need a website that is designed for attracting sales and leads, or as we say that is conversion optimized, if you go to a designer who does not understand what it takes, that will convert your prospects, he would build you a pretty website that would be useless. But another thing is, even if you have a perfect website, your journey to earning money through this website is just starting, because you need to attract traffic, and not just random traffic, you post the link on Reddit and people come looking at your website, you need to target a traffic from people who are interested in your offer and ideally who are already in the mindset of buying either your products or your services. So, the biggest misconception is, over-estimation of a website, but I say it is just the beginning of your journey, there is so much work after you actually get that. You thought you spent months, maybe a year building a website, but it is unfortunately just the beginning. Welly Mulia: Interesting. So, you said you need targeted traffic to go to your website… what do you suggest people do to get targeted traffic and not just any kind of traffic? Gill Andrews: I can’t say it in one sentence, it is a complicated thing, but first of all, it starts with knowing your audience, you need to know where do they hang out? How do they use such? Are there specific websites or social media you can reach them? So, it first starts with studying your audience really well. Then there are 3 major ways to drive traffic, it would be when your first search optimizes your website, after some time, and after you put a lot of content in it, and the people who search for particular terms in Google, would come to your website, which is the ideal situation… But sometimes, it is not possible, sometimes your audience either doesn’t know your product exists, or they don’t have time to read blogposts and search for you, so it won’t work for every industry or every niche. But actually, I would say it works for most of the cases, the cons are that you need a lot of time, you need a lot of effort and of course it would cost you money, either your own time or you pay somebody to do that. So, it’s costly and it takes time to work. The second way is social media, which is not as effective, because people on social media, who hang out there, they don’t hang out to buy stuff, they hang out to socialize, to talk to each other, to discover whatever, but not to buy things, so this is also difficult. It also takes time and it is less predictable. And the moment you stop posting, you stop getting traffic, but it’s very good for making connections with your peers, especially if you are a blogger, people you get to know may give you a backlink, a link to your website, or you introduce you to their audience, it also helps your search performance if you do such. And the third way is something that you will get direct results and something that will help you revaluate your website, that you can see whether your website is actually good. Conversion optimized, it is paid traffic, where you pay for Google ads, Facebook ads, but then of course it’s expensive, and the moment you stop doing it, you don’t get any results. I know many small businesses who are doing it on a constant basis, so they are investing some money in pay-per-click campaigns, but they get so much put of it, they sell so much, they get so much contracts, that is worth the money. Usually it’s a combination of 3 of these tactics, I can only speak for myself, I am a consultant, I am my product, I sell knowledge… So for me, search works the most, I don’t have much time to post on social, I concentrate only on two networks, and I use it primarily for building relationships and getting backlinks, although I also gat occasional contracts from there, I don’t use pay-per-click. Why I don’t think it is a good idea for consultants, because for us, our product is less tangible and although when you see a sweater, you can say, made of wool, red color, my size fits, you just order it, there is like little work for a prospect, you can give it back if you don’t like it, but for consultants, people usually need to get you a little bit more, so my sales cycle is longer, than the sales cycle for somebody who… the funnel, the time it takes from the first touchpoints, the first time people heard of me, to hiring me to work for them, it takes longer than somebody buying a sweater. So, if you say, I sell physical goods, pay-per-click can be super useful and profitable. But for consultants or for anything that would take longer than 1 lead page to convince people to work with you, or to buy, probably other means would be more efficient there. This is a long topic, how to drive traffic, I am sure there are paid courses about that, consultants who would do that, so it is really, super complicated. Welly Mulia: So, going back to what you were saying just now with a consultant like yourself, the sales cycle is longer and you typically for yourself don’t do any paid ads. I see some consultants also doing paid ads, but instead of selling via websites, they sell via strategy session. What is your take on that? Gill Andrews: I don’t have any take on that. I am just saying, do what works for you. Before you start doing something, think about if it logically makes sense so you need to have some kind of hypothesis, why you think it would work, and then you try it, because it can even depend from person to person. Not necessarily niche to niche, because your website can have a different flavor, a different impression on people, and even if your friend does absolutely same thing, it can work differently for you two. So, if you think that is a logical reason for that to work, just try it out, this is my suggestion. Because actually, an answer to every question related to website is actually, it depends and test it, this is the answer that is actually valid to any question related to website because every website is different, every niche is different, and the best way to know what works for you is to test it. 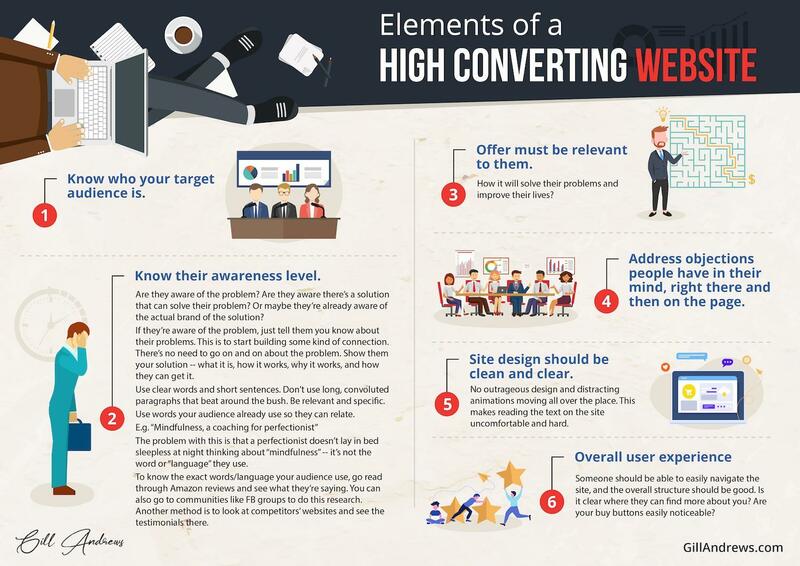 Welly Mulia: So, what do you think is the main element of a high converting website? For someone who is new, like co-traffic, co-people who haven’t heard of your brand before or never seen you before, they land on your website or landing page. What would you say are the areas that need to be there for them to, at least signup for your email newsletter, or maybe if they land on your sales page, at least click the ‘buy’ button. Gill Andrews: So, you say they have never heard of me… But this is not a qualifier for what kind of quality traffic is that, the question is do they have a general need for what I offer? Or are they coming from Pinterest recipe board, who are these people? Is the first question. So, I first need to know, whom am I writing for? It starts with the stage of awareness. Before you would have thought about, is it male or female, what are their status, what language do they speak, what are their background, quality of education, high school, whatever… So, these are the very basic requirements that you already need to think about before building a page. And then you think about… you have an offer, you offer something, so it’s still same, the question is what do they know about this problems, you already said they don’t know me, they don’t know what I offer, that’s fine, but the question is, are they aware of these problems? Are they actively seeking to solve them? Or do I still need to narrate the exact problems to them? So, these determines that stage of awareness, are they completely unaware, are they problem-aware, are they solution-aware? What are they aware of? And after you determine that, you determine the place, then you determine the spot where they are at right now. Now, you need to build the bridge with your copy to take them to the spot, they need to be to convert. So, basically what they need to know to convert is, what you offer exactly and for that to be relevant to them, so it means you need to use very clear topic, not trying to be clever or whatever, just say in plain words what humans use, by talking to each other, what you offer, for whom? If it is for example, specific population segment like creative women entrepreneurs or CEOs of technical companies, if you have a particular segment, it always helps to name it, so it is immediately relevant to your target audience. Say what benefits people get from your solution or product, how these would help improve their lives, but depending on stage of awareness, you need to talk either more or less, you shouldn’t tell them things they know, you should only indicate that you know them as well, so that people connect with you. But you shouldn’t go on and on about things people are already aware of, for example, they are aware of their problems, if you are marketing to some business owners, you don’t need to tell them about their problems to their website, they know it, they have been using this website for 5 years, just tell them you understand the problems, but then you need to work harder on showing how your solution works, how exactly you solve their problems and why it works. Then you need the information to be relevant and valuable, not just empty or vague sentences, really specific, naming things, ideally the way your prospects think about your offer. For example, I am writing my newsletter, so it is on my mind… I recently was reviewing a header of a page and somebody had on the page, mindfulness coaching for perfectionist. At first it sounds like something fine, like what’s wrong with that, it’s in clear words, I understand that, but the thing I perfectionist don’t lie in bed thinking at night, oh, I need mindfulness coaching, this is not the words they think about their problems, they don’t use these words, they don’t use these concepts, so you need to talk in a way, so that people can relate. If you are lucky enough when you did your research to use the exact same words your prospects used in their mind to describe their problems, you will establish immediate connections and they would trust you more, because it will feel for them as if you are reading their mind… just yesterday they talked to their spouse about their problems using the same words and today they found your website. Even if they have never heard of you, there would be immediate connection, so it is really important to know your target audience and you know the words they use, for that you can go and read Amazon reviews, you can hang on social, you can go check out other websites of your competitors, to check their testimonials. You need to always ask about testimonials and feedbacks, so that your clients not only send you a quick email, that’s fine, great, send me an invoice, but that they describe their objection and whatever… What you also need to do on your website is address objections, this is very important. I see websites just throwing information at people, here is what I do, here is the ‘buy’ button, but people have a lot of questions, they have a lot of affairs, uncertainties and suggestions, you need to address these questions as well, and not on some separate page, but really in the context, where you are talking about your offer. But this was in the content, running a successful website is bloody complicated, this is just a copy signed. Then you need to make sure your design does not interfere with your message, because your website can be pretty but it can have a slighter, it can have 15 different fonts, and it can cause so much friction, that even the best copy would be rendered irrelevant, because people just won’t be able to see what’s important, they would be so overwhelmed with visual triggers, they will be like my brain is having a seizure, I would have to leave. Literally, even a page, you would say it is a nicely designed page, this is what we would be doing today, a nicely designed page, but once you start reading, there would be so much distraction thee, there is a part that is covering too much of the space, there is a navigation that is so huge and it totally makes the reading uncomfortable and then elements that move, people are generally irritated by anything that moves without their control, so you need to use it very rarely and think about how you use it, so this is another side of it. So, we said copy, it needs to be clear, relevant, valuable and speak directly to your audience, address their objections and name the benefits. The design shouldn’t get in the way. I don’t think a pretty website is a good website. I think a good website is the website that does its job, it can be ugly or whatever, but there are ugly websites that are still doing their jobs, better than the website that was designed yesterday by using the newest technologies, this is not the point. Sure, it shouldn’t be like super horrible in colors or whatever, that on the basic subconscious level, it would gross people out, it shouldn’t be like that, but you shouldn’t overdo it with these flashy things. So, you can see I have been talking for 5 minutes answering all different questions, that’s why there are people like me who help people to do that, because it is super hard to do it on your own, and even when you write all these articles, still you would see things and be like, nobody writes ‘about’, and you will be like, I didn’t know that existed anymore. Welly Mulia: Great stuff Gill. So, what you covered just now is if someone goes to our website where typically nowadays, as small business owners, especially with coaches, consultants, it is usually about their ‘About’ page and the have their services page. What about specific landing pages, so for example sales page, lead capture page? Would you suggest that we lose all the navigation? Because you talked about navigation just now for a general website or a blog. What about the lead capture pages and the sales pages? Gill Andrews: Well, sales pages, lead capture pages, let’s follow the lead capture pages, because sales pages can be seen on the website. All of that that I just said applies, because it is a sub-set of how to make A page work or A website work, just remove everything about navigation, on lead pages they shouldn’t have any navigation to a different page… But again, it is your target audience, they would probably have a narrowed interest because landing page, you are probably driving traffic from a pay-per-click campaign or from a very specific other source, people who click on that link they have a very specific problem, a very specific mindset, right now they are in a very specific mind state, but again this is your time to do it, it is the clarity, value, relevance, a little distraction, addressing objections, these all hold. Everything that I just said, except okay, they have to navigate somewhere… they don’t have to navigate somewhere, but you still have someone who is at this particular spot right now, this particular mindset, with this problem, these objections, and you have this place where you need them to be to convert and your landing page is building a bridge to bring them from place A to B.
Welly Mulia: So, typically, you probably thought that this podcast was a little bit weird because typically the first thing the host would do is, tell me a little bit about yourself and what you do, I started with a different direction because I like to do things a little bit differently. So, now is the time I would like to get you to tell a little bit about yourself, how did you become a copywriter and a website consultant? And how all of these came about? Gill Andrews: First of all, I didn’t think this podcast was weird, I would like to address that… it is fine by me, you are the host, so you can ask whatever you want, the order you would like to do things is really up to you. So, how did I become a consultant? It was actually again by accident. I used to work as a software developer, I studied mathematics and computer science, and I worked as a software developer, I was more or less happy, I know there were such things as online business, I just thought, okay, my 9 to 6 job was fine… And then I went on maternity leave because I was pregnant with my son, and I got super bored, and I was like, this is so boring, and I started a blog, not this one, a different one, and I of course wanted it to succeed, I started reading about a lot of things, what makes a website work, and I learned a lot, but I also was like, okay, all of these things, so many of them I already know, from my previous experiences and from my work as a software engineer, because I was also an I.T consultant, we also developed URL and stuff. I was like why is everybody so excited about that? I mean, this is common knowledge to me, and then I was in this community of bloggers and website owners and I started giving them advice and they were like, they liked it and then my friend hired me to help her. And when it was time to think about whether I would be coming back to my job, thankfully in Germany, you get 3 years off for maternity, so I had 3 years to think about it. So, after 2 years, I already started getting paid for that. And then I had to make a decision, whether I would leave it as a kind of hobby on the side, which I thought that I probably won’t be able to maintain because of the family responsibilities, or I just jumped in and say I would ditch my office job and I would try doing this. And because this gives me so much joy and so much fulfilment, because I talk to real people, in my normal job, I used to talk to some bankers and insurance companies, employees who didn’t have their personal stake in the company, it was like huge corporations, and these people were just working their 9 to 6 jobs, they don’t really care about a lot of things. And I also didn’t see the results immediately of my work, so what I do now is much more fulfilling, of course it was hard especially the first two years were hard, I had weeks where I would go on 4-hour sleep, not because I worked so much, but because there were a lot of other things I had to take care of, but I thought it was a better possibility because it gives me balance between family life, between the time I get to spend with my son who is growing up so quickly, and doing things I love, because office job wouldn’t allow me to do that. I was lucky that I didn’t have to earn money right away, because thankfully my husband, he takes care of that. But I had a chance to pursue my passion, and I did that, I was really happy I did that, and after things picked up, this was a great feeling, because you are there for 2 years and you see it start to work out, so it was a good decision. So, this is where I am now. And it may sound unusual to some, but I can tell you, so many people have a similar story where they were on a maternity leave or broke a leg, and it gave them a pause, it paused their past lives and it revalidated something and decided that they don’t want to continue like that. Welly Mulia: 3 years is a very long time for maternity leave in Germany, do you actually get paid? Gill Andrews: We get paid, I think one year it is paid and 2 years extra you can stay at home and your job would be secured for you. But pay leave is only one year. Welly Mulia: What do you think is the number one problem for online course creators? I know that you work a lot with small business owners, and I don’t know if the problems are the same, but based on your experience for online course creators, those who have excelled in training programs and online courses, what do you think their biggest challenge, number one problem is? Gill Andrews: I think their biggest challenge lies not in the website themselves, because their websites are quite typical, concerning courses, it is not that different from consulting. You build the landing page and whatever, but the thing is, to sell people on courses, because there’s so many courses these days, everywhere, so why would people choose you? You need to make a case for yourself. So, I think their biggest problem is that they try to sell directly from the website, or if they have for example a freebie and they get people on their list, they neglect their marketing, and they do email marketing not ideal, because it is about nurturing the relationship, I think selling courses, unless you have a name, especially if you are a newbie in selling courses, this is very difficult, because why would people trust your expertise, that’s unfortunately not something you can slap on your website and hope that people would buy. There are a lot of things around it that you have to do, you have to make people notice some other places, trust is a big factor, would it be a good course? So, somehow, you need to make sure people see you somewhere else as well, because I can imagine that not many people would buy it on the spot unless it is like a super course nobody is offering and you have a thousand of page reviews. So, first of all, I would say leaving your website, because we are talking about achieving the final goal, selling your course, for a second, forget about your website, think about your overall process, you have a person who has never heard of you, never heard of your courses, how do you generally sell to them? What is your idea, what are you hoping for? Are you really hoping that they would go on the website, read one or two pages about you and buy your course? This is what you are hoping for? Then my question would be, why do you think it would be the case? Write down those objections they may have, and see, are you addressing those objections? And you may find out that it would extremely difficult to sell to the person who has never heard of you. And then you would need to think about different means, then you would need to think, okay let’s concentrate on getting people on my list, and then I would for one month, show my expertise, and only then I will pitch my course, because they say you first need to get people to know, like and trust you and its super hard to do with just one page or two pages. So, think about it, can you make people know, like and trust you just from your website? If not, you need to think about the different rule of selling. So I would say, because courses are not as tangible as an apple or a sweater that you immediately see the quality and you can safely return it if you don’t like it, and of course cost more than sweater. So, there are a lot of things to consider here. Welly Mulia: Okay, so you talked about possibly capturing their emails and then following up with them, and giving them value so that they know, like and trust you. And were you suggesting that in the first few emails, you don’t actually sell anything to them? Welly Mulia: So, in the few emails, you provide value to them… Based on your experience, what would you say is the… after how many emails would you be open to say I will drop a sales pitch over here? After how many days have they joined your list? Do you have like a guideline for that? When they can start pitching? Gill Andrews: It is not about the days, it is about the engagement, you shouldn’t pitch it to everyone, you should pitch to people who engage with your previous emails, and the number of days, I can’t tell you, you need to see for yourself, how often are you sending emails? If you are sending once a week, and you see that they opened all of them… I don’t know, I would say it depends, after 3 emails it is okay to pitch, but the decision depends on what was in the email. Before that, I would write one of these emails, asking them to do something small, like to share it, or check out a different post, what I do in my emails is like I have texts that provides value, then I say, I have a challenge for you, go to this post of 20 more mistakes people make on the website, and if you don’t find any mistake, you get to ask me a question, and I would answer it for free, but if you find a mistake, you share it on social. You shouldn’t just talk to them, you should try to engage them, and the moment you see that somebody is engaging with your emails, it means they are already moved on the scalar of liking, knowing and trusting you, somewhat closer to trusting you… But it depends also on your personality, I am not comfortable with selling quickly, I would rather write to people for 2 months before I ask them for a commitment, but it again depends on what works for you, what kinds of emails they were, and I also would definitely segment them. So if somebody didn’t open 3 of your last emails and then you send a pitch email, maybe they were on vacation, maybe those emails didn’t seem relevant to them, so it means they did not get anything from that. So, for them, your pitch email would be like the first email if they opened it, so there is no point then, of sending sales email to someone who didn’t engage with the emails. It also means you need to clean your list regularly, which I do every month, I send an activation email, short email without fancy stuff, asking whether everything is fine, and whether they would like to stay on the list. If they don’t respond within 2 weeks, I just delete them… not a lot of people, because some of them are literally disinterested, but some people come back, and then you deepen the connection, you talk to them like you would talk to a friend who haven’t messaged you for a while. So, it’s about also making… there are a lot of things to keep in mind, you need to keep your interaction as close to personal human interaction as possible. Of course it is not ideal, you are writing to so many people as well, and it is difficult to make your email sound personal, but you should try, and you should always think, if it was this person, would I ask at this point, would I say this or that at that point? This would guide you. Also texting also works, you can again segment them, and for one sub-list, you are sending a sales email, after 2 emails, for another sub-list after 4 emails, and you see what works better, this is also a way to know. Welly Mulia: So, you actually said you send monthly email, asking them if they want to continue to stay on the list? Gill Andrews: No, this would be crazy… Every month, I filter out subscribers that haven’t opened any email within 3 months. And to them, I put them in automated sequence, that is called ‘reactivating’, I reactivate subscribers, I remove them from the main list, it means they won’t be getting anymore emails from me regularly, but they would get an email saying, ‘are we still good’, in the sense of, I noticed you haven’t opened any of my emails, I wanted to as if you wanted to stay on my list, you don’t have to reply if you don’t want to stay, in two weeks you will be removed, but if you want to stay, click this shiny button that says ‘yes, I want to stay’. And they click the shiny button and the automated sequence puts them back, they are redirected to an automatic page, that thanks them for staying and they are put back in the list, which also means they will remember your name again, when it pops up, a couple of days, but whoever does not respond gets thrown out, so I know the people who are on my list are more or less interested in what I am talking about. Welly Mulia: Okay, that makes much more sense. So, how do you currently get leads and customers for your business? Gill Andrews: For me, once again, there is no direct way, because as I said, people need to have heard about you a couple of times to warm up to you. So, I get customers from such that come… they literally searched for website review and come on my service page. But I also get enquires from LinkedIn, where I started posting website ‘tip of the day’ series I think last April, and every week I post 2, 3 very focused tips with an image, not it’s like tip 115, so it has been very regular, and I get very good feedbacks, and I got clients from LinkedIn, but I also get clients from my list. Funny story; one of the biggest contracts I got was from reactivated subscribers, the sequence I just described to you, this person… because when I write to them and say… not reactivated but I regularly check my email software and there was some glitch and some people haven’t got an emails in half a year, so I also took all of these people and wrote them an email saying, I am sorry, something went wrong, to make it up to them, they get to ask me questions about their website. And this person wrote me and asked me questions, and I recorded a small video for her, and after that I am now redesigning and rewriting her whole website. So, taking care of subscribers also pays off, just like of course regular subscribers also write to me and say, you can okay, you can you review my homepage, and the funny story, I don’t I have ever sold anything to them, because I literally have nothing to sell so far, except for these reviews or a copywriting, so no course and no book, and it was very rare that I said, okay, contact me if you need something, but they still do, because they follow me on LinkedIn, on Twitter, we have multiple connection points, and sometimes I hit the knob, sometimes they get newsletter which is about the exact same problems they are dealing with. So, it is super important also to know what problems people are struggling with, and when they see an email like that, they contact me and say, okay, I am struggling with exactly same thing, can you help? And I say, yeah. So, it’s different, it is hard to say this is one particular channel, there are 3 channels, search, LinkedIn and my email newsletter. Welly Mulia: Okay, so with your case, do you have… because consultants usually have like a strategy session, maybe 30 minutes, 15 minutes or strictly the first time interaction with you. Gill Andrews: I don’t do free… first time interaction, my free consulting session is my newsletter, there you will learn so much and so many people never hired me, improved their website. I don’t believe in these free consulting sessions because already, I am taking my personal time, it doesn’t make sense to me to be honest, also because I am in such a different time zone, I work a lot with clients from the U.S.A, Canada and Australia. So, we are so apart, it is impossible to find time to talk. Yeah, they can read my blog for free consultation as well, my blogs very detailed and very focused on things that usual blogs don’t write about because it is probably big websites don’t struggle with that or big websites don’t think about things like that. But I write about very specific problems of business owners and if you go through my blog, you will find a lot of things that speak directly to you, to your problems you have now. So, this is my demonstration of expertise. Before I start reviewing a website, of course there is some kind of, get to know your problems situation, where I send out a questionnaire that I combine every time specifically for websites, asking questions, often target audience kind of problem, I of course don’t give any website suggestions without actually having talked to a business owner and learned about their business, but there are no free consultations. Probably it works for someone, but it will not work for me. Also, I am introverted, it would drain a lot of my energy, you need to prepare before the session, you can’t just be doing something and then subscribe and immediately come back. And also around this time, to prepare and to be composed is too much time wasted, I would say. Welly Mulia: Got it. So, what does a day in your life look like? Gill Andrews: Such a nice question… My days are really monotonous. I get woken up by my son who wakes up really early, then I drag myself into the living room/kitchen which is like a big space, I give him food, then I try to doze a bit while he is eating, then I bring him to kindergarten, when I come back, I have breakfast and I start working right away, till 3 o’ clock, having a break for lunch and get up to move a bit when I feel a pain in my back or something, but usually it is like work, work, work… it is either client work or some work on a new blogpost or my own website if I can squeeze it in, because there are weeks I don’t touch my website because I just have so much to do. There are times like that, but I do try to keep it down and not work in the evenings, or at night. And I really would like to bed at 12 latest, it is not always possible. This is how my day is… Sometimes I get to go on a podcast as you can see today, but this is not usually the case, usually it is just desk work, you sit down and types things and design things, and write things, but it’s very boring, my favorite part of that is when I get client feedback, because it is thankfully positive, it really makes my day, and all these pain, all these not sleeping really pays off, and people write there and say, waoh, I have worked with 3 people but nobody understands me like you, this is perfect, we are so impressed. I wouldn’t get it if it were to be anonymous, I probably wouldn’t do it just for the sake of website review, of course it is great to help people, but if you don’t see how you help them, if you don’t see people appreciating it, this is not the same. Welly Mulia: Have you thought about creating your own online course? Gill Andrews: Yeah, I did, I even tried and then I gave up. Gill Andrews: Because it was just over me, because the things I would like to share, I noticed there was so much, it was like probably if I wrote it into a book, it would be lie 600 pages, so I was like, okay, I need to start small, because I don’t have any paid offer so far on my website, so I would start with a book, I am currently combining my LinkedIn tips into a book, especially because people ask me for that. Actually they asked me to make a book on LinkedIn, and I am happy to comply, because now I know people are waiting for it, so I already have an audience and this would be a small commitment, because the course I would have the price really high and I don’t want to do that especially for people who have never bought anything from me. And I noticed that I would need help creating a course, probably someone who would digitally combine materials for me, and right now, I just don’t have the time to find this person, I don’t have the time to deal with that, because there are still a lot of client works, so I decided to start with a book, but I absolutely… course is definitely on my mind, but I think it’s at least on year away, because it is really a lot of work, videos, the slides, it just gives me anxiety just thinking about it. But it’s a good idea, I like teaching, and my newsletter teaches, on LinkedIn I teach, even in my website reviews, I teach, because I don’t just say this is wrong, I tell people why it is wrong, so they know if they see the same reason somewhere on their website, they would know this, that they should do it again. And I also tell them how to make it better, and I also give them like a summary of the website reviews, where I summarize the most common problems for the copy as well, and I say, don’t do this next time, do it like that. Welly Mulia: So, if you can only give one advice to people listening to this, what would you say to them, if they want to build a profitable website? I know you covered a lot of points just now, earlier in the show, but if you only give one advice, what would it be? Gill Andrews: It is hard to give one advice, also the question is, what kind of people are those? Do they already have a website or are they thinking of getting a website? Welly Mulia: Let’s say they already have a website, but it is not converting as well as they like. Gill Andrews: This is very hard, I really have to pass, it is not possible, if I give you any kind of advice, it may be wrong because websites can have problems with conversion for so many reasons. I would say, get a specialist to look at it, who can give you an advice literally. Because I can’t read minds, I can’t read things that I can’t see, it’s impossible, sorry, it’s complicated. If you’ve tried everything you could yourself, get professional advice, because you are not going to make it yourself, sorry. Welly Mulia: So, where can I find you? Gill Andrews: My website is gillandrews.com, and I hope it is pretty straight forward, just click services and take it from there, whatever you need, copywriting, or a particular reviews , like homepage review, or a whole website review or just a session where I can review something in person in front of you, or you get to ask me questions like you asked me right now, something very specific, like should I do this on my website, or should I do that on my website, if I am thinking about my sales funnel, and what should I do, does it make sense? And stuff like that, so I also offer personal consultations if you think such a website review is not exactly what you need, you can rather ask me specific questions. 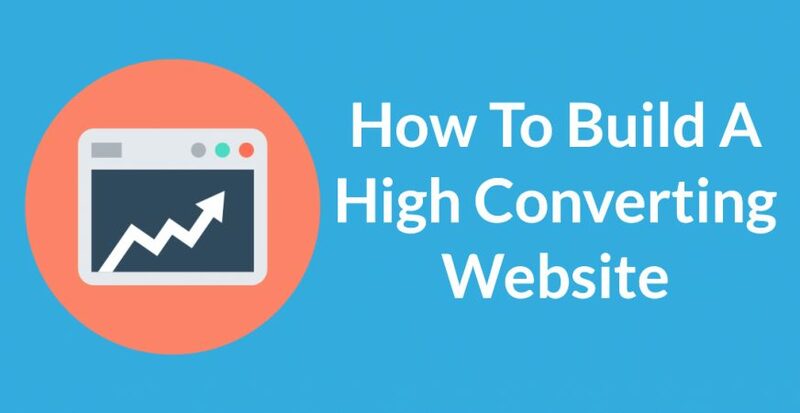 So, anything you need to help your website convert better, I can help you with it. Welly Mulia: Okay listeners, it is gillandrews.com. Okay, thank you again Gill for sharing your insights into the whole website conversion process, it is really great to have you here, I am sure the listeners are going to find tons of value out of this interview, thank you for coming to the show. Gill Andrews: My pleasure. It was nice talking to you. The Ultimate Website Content Checklist — use this to fill every page of your website with content your audience will love and turn your website into a business generating machine. 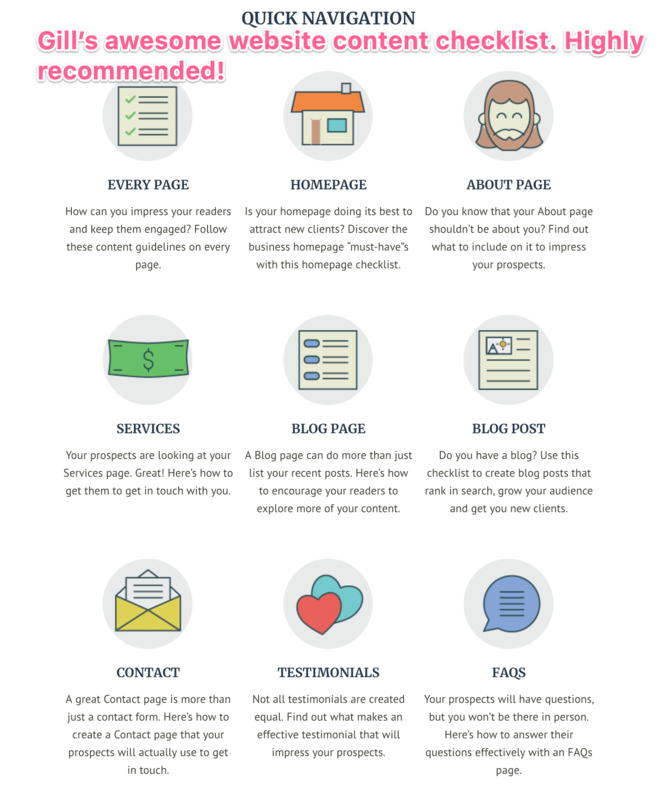 Whether it’s your homepage, about page, services page, blog page, blog post, contact page, testimonial page, or FAQ page… this checklist has them all! Click here to get it free (no opt-in required). ULTIMATE WEBSITE CONTENT CHECKLIST: Turn your website into a business generating machine!